My hubby and I went to a Halloween party last night, and I thought instead of posting what I’ll be wearing today (raincoat and rainboots- another soggy Saturday soccer game), I’m going to post our costumes- in case you are looking for a last minute idea for your party! I went as Katy Perry and hubby was Russell Brand. I couldn’t find a Katy Perry costume, so I bought at blue wig, a Candyland dress (who goes as Candyland?) and the piece de resistance was my cupcake bra! I bought a hot pink bra at a local thrift store- and then found some soft, squishy cupcakes and super glued them on. 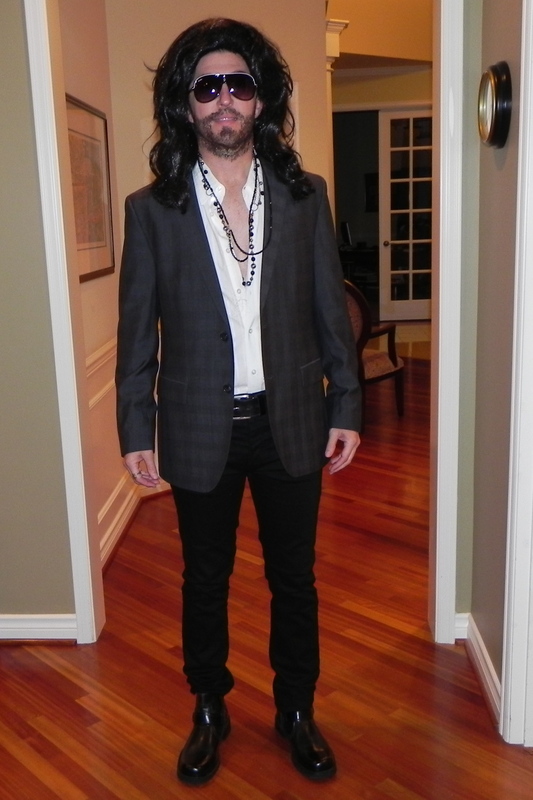 My cute hubby went as Russell Brand- he bought skinny black jeans, and then wore them with a white shirt unbuttoned, a sports coat and then a wig, sunglasses and some jewelry. The best part of his look was that in order to look scruffy and have facial hair he took hair wax and spread it on his face, then he opened a tea bag and spread the tea leaves all over his face. It stayed on all night long- and truly looked authentic! 4. Steven Tyler- complete with missing tooth and black eye- hilarious! Hilarious! So cute…thanks for sharing! this is hilarious! i absolutely love it!!! You guys are ADORABLE! Would not have recognized him in a million years. What a great idea.